Is your family crazy about the Harry Potter books and films? You can put this Orlando, Florida, destination at the top of your vacation wish list. 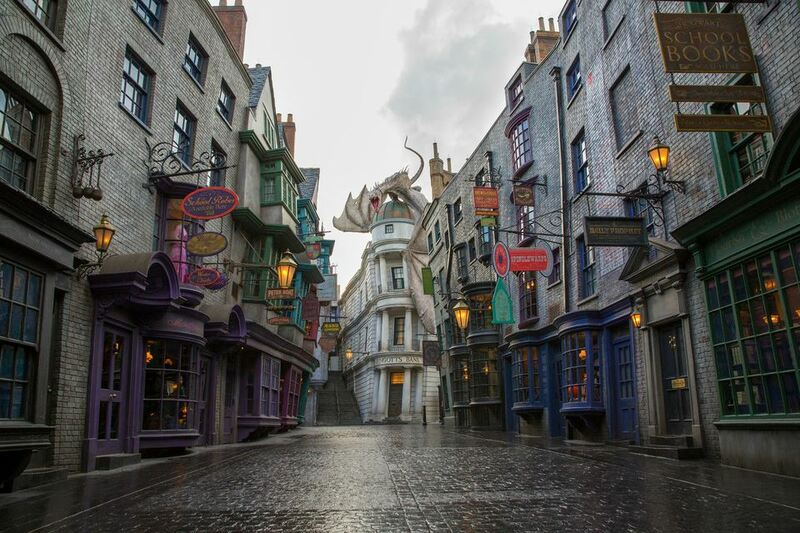 The wildly popular Diagon Alley comes to life at Universal Orlando Resort, where 'London' has been recreated. Diagon Alley features shops, dining experiences, and a marquee ride called Harry Potter and the Escape from Gringotts. Harry Potter’s adventures at Universal Orlando now stretch across both Universal theme parks. Just like in the Harry Potter books and films, you find yourself in London and pass through the iconic brick wall archway into Diagon Alley, the bustling, wizarding hub within a Muggle city. This marquee ride immerses families into the Gringotts vaults right at the iconic moment from the Harry Potter film series where Harry, Ron and Hermione break into one of the most guarded places in the wizarding world to retrieve a magical object that will help defeat Lord Voldemort. Families get to see the 60-foot, fire-breathing Ukrainian Ironbelly dragon atop Gringotts Wizarding Bank and pass through the marble hall where goblins are hard at work. The ride is a race through a labyrinth of underground Gringotts vaults, where you encounter the villainous Death Eater, Bellatrix Lestrange, and come face to face with He Who Must Not Be Named. You can grab wizarding essentials at Wiseacre’s Wizarding Equipment, one of the shops located in Diagon Alley. It's the place to pick up items such as telescopes, binoculars, armillary spheres, compasses, magnifying glasses and hourglasses. Weasleys’ Wizard Wheezes is a shop full of novelty items, magical jokes, and toys inspired by the books and films. Stop into Ollivanders: Makers of Fine Wands since 382 BC, to choose the perfect wand. When sunny Orlando gets too hot, you can cool off with a treat from Florean Fortescue's Ice-Cream Parlour. Don't leave Diagon Alley without trying butter beer at the Fountain of Fair Fortune. It tastes like a cross between cream soda and butterscotch, with a toasted marshmallow froth. Delicious! Just like in the books and films, you will board the Hogwarts Express and travel between Diagon Alley and London to Hogsmeade in The Wizarding World of Harry Potter, which opened in June 2010 at Islands of Adventure. As part of the experience, you'll pass through the brick wall at King’s Cross Station to arrive at Platform 9 ¾, then watch as the Hogwarts Express pulls into the station with its billowing steam and authentic whistle beckoning passengers to hop aboard. Once aboard the Hogswart Express, the journey will be filled with views of London and the British countryside as well as a few surprises. For example, you just might spy Fred Weasley flying by on his broom. You can look outside your cabin window and enjoy a scenic journey and also encounter magical creatures, like Buckbeak the Hippogriff swooping gracefully over the black lake. From your train cabin, you'll see Hagrid come alongside the train on his flying motorbike, and later greet you at Hogsmeade Station. Just like in the books and films, you'll board the Hogwarts Express at London's King's Cross Station and arrive at Hogsmeade Station in The Wizarding World of Harry Potter, which opened in June 2010 at Islands of Adventure. That area includes the village of Hogsmeade, the iconic Hogwarts castle, and the Harry Potter and the Forbidden Journey attraction.